Transfer on death deeds are nontestamentary ( 93.957). This means the property conveyed at death does not become part of the estate, and passes to the beneficiary without the need for probate distribution. Because TODDs deal with disposing assets after death, however, the transferor must meet the same standards for mental capacity as needed to execute a will ( 93.959). The TODD itself must meet the requirements set forth for a "properly recordable inter vivos deed," except that it must "state that the transfer to the designated beneficiary is to occur at the transferor's death" as well as identifying the primary and alternate beneficiaries by name. Also, it must be recorded, DURING THE OWNER'S LIFE, in the county where the property is located ( 93.961). In addition to the content requirements, standard (inter vivos) deeds generally transfer a permanent present interest to the grantee (buyer). In the most basic terms, this means that once the deed is executed and recorded, the grantee owns the property. Unlike an inter vivos deed, though, TODDs do not require notice, delivery, acceptance, or consideration ( 93.963). By recording the TODD, the owner declares an intention to convey a potential future interest in the land described in the deed. Since the obligations in favor of the beneficiary (grantee) do not apply, TODDs are revocable. Land owners who record TODDs retain absolute control over and use of the property while they are living. They may sell, mortgage, or otherwise convey the real estate with no penalty, and no obligation to notify the beneficiary. 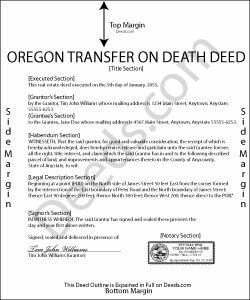 Transferors may also change, revoke, or otherwise modify the terms of the original transfer on death deed by executing and recording a revocation form; a new TODD with different beneficiary information; or an inter vivos deed transferring the owner's interest to someone else ( 93.965). Just as some owners may wish to change or revoke a beneficiary designation, some beneficiaries are unable or unwilling to accept the transfer after the owner's death. To address this need, beneficiaries may disclaim the interest in land by following a statutory procedure( 93.971). Ultimately, TODDs offer a handy, flexible estate planning tool to owners of Oregon real property. Before deciding to use a TODD, consider its potential impact on taxes, access, and eligibility for income-and/or-asset-based benefits. Each situation is unique, so for complex circumstances or with additional questions, contact a local attorney. Inter vivos: "between the living" Inter vivos deeds, such as warranty deeds or quitclaim deeds, transfer a permanent, present interest in real property during the conveyor's life. Nontestamentary: After-death plans not included in or affected by the deceased person's will. Probate: Court-supervised administration of a deceased person's estate.